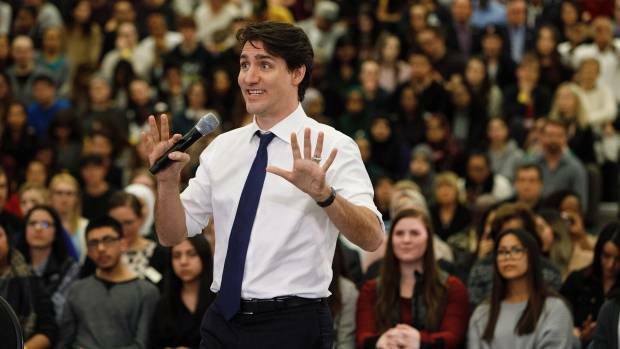 At a public town hall event, Canadian Prime Minister Justin Trudeau interrupted a woman when she used the word "mankind" in a question to suggest she use the word "peoplekind" instead. The woman who asked the question is a member of the World Mission Society Church of God, a religious organization that has frequently inspired controversy and even been characterized as a cult prone to brainwashing its members. Her question regarded the difficulty her organization was having with Canada’s regulations that restrict volunteer work that can be done by religious groups. Trudeau has declared himself a feminist, wrote an essay on raising his sons as feminists and has been a champion of women’s rights. His cabinet is also Canada’s first one to have an equal number of men and women. So his word correction is in line with his strong stance on gender equality. The exchange has garnered some backlash against Trudeau, from snarky tweets to full-on editorials in publications like the Toronto Sun. However, the interaction ended in a cheer at the event itself. And during a time in which outlandishly offensive remarks by political leaders are becoming commonplace, it may be for the best when one leader’s comment shows an appreciation for inclusion and ends with applause from the crowd. Next, read up on six feminist icons who don’t get the credit they deserve.